Story about successful business model innovation on the case of Alexander Osterwalder book Business Model Generation. Three things is worth remembering. First: never generate business model prototypes alone; second: don’t spend to much time on every single prototype; and third: do not write on the Business Model Canvas itself. What is actually a business model innovation? Why would a blogger want to innovate its business model? Is that possible? Well, a really well known blogger has used his blog to a real career breakthrough. Before you read the successful story of a blogger, you should know what is a business model. The business model is by definition a system that explains how is somebody creating, delivering and capturing value. Whereby busines model canvas is a tool that allows you to describe, design, challenge, invent, and pivot your business model. For more on on business model canvas, please see this video. And now to the story. The story of Alexander Osterwalder reads itself almost like a movie. First you need to know that people in Swiss, where Alexander comes from, are really good at inventing. At various rankings Swiss regularly tops or is near the top. Alexander was a PhD student, who wrote a blog about the subject of his thesis, the title of the thesis was: Business Model Ontology. His blog on the subject was pretty popular one. He successfully defended his PhD thesis. And then stopped blogging for a while. In the meantime he was conducting workshops on designing business models. He was challenged by the attendees of his workshops that he should write a book on the subject. His mentor argued that to prove his thesis in reality he should invent a business model for publishing a book. And he did! How you might ask? First, he (and his mentor, if I remember the story well) prototyped eight different business models. It’s something everybody could do, I would argue. Then decided to re-launch his blog. He announced that he will start writing a book in the six months from the announcement. In the meantime he invited readers of his blog to be co-authors of his book. For a fee. Why the fee? Alexander wanted to create a book, that he would be proud of. Not just another text business book. He calculated that he would need a budget of €250,000 (which is more than a decent budget I would argue, but hey, this Swiss guys are really serious in the terms on money, look only at their banks). Pricing model was: in the first months before the start of writing, the fee for co-authors was $24, and in the last week before the start of writing the fee was $250. Yes, $250. Some people, from the USA I must add, did pay that. The budget was there. Writing could start. With more than 400 co-authors. The book is a huge success, only in Germany it was announced as the business book of the 2011. The rest is history. What can you and I learn from the story? Alexander Osterwalder and his mentor did sketch eight business model prototypes. I don’t know if they tested every single one of them, but it is a fact that a model called co-created book has brought them enormous success in publishing their book Business Model Generation. 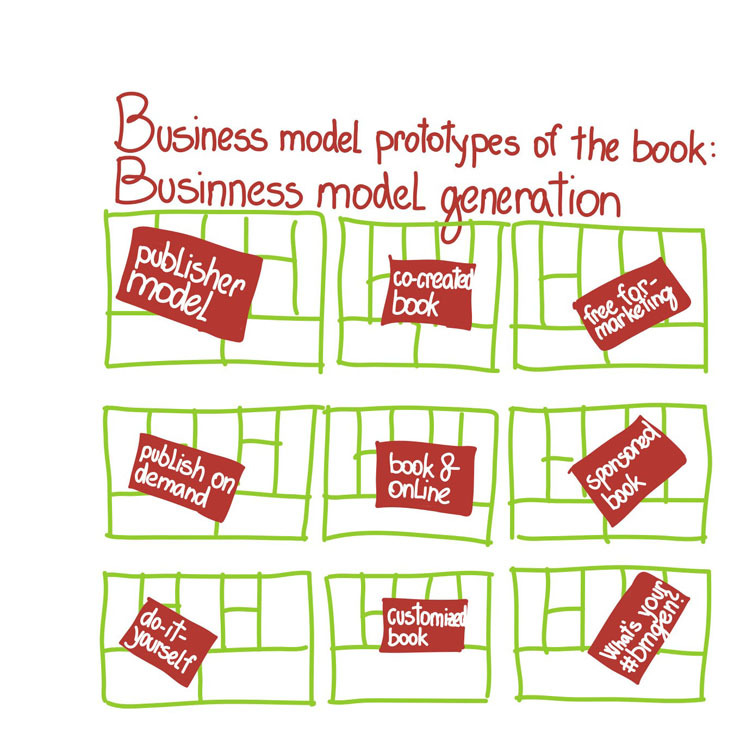 Business model prototypes: publisher model, co-created book, free for-marketing, publish on demand, book & online, sponsored, do-it-yourself, customized book. Source: Business model generation book. What should you learn from the story? If you will remember one thing from this story, let it be this one: never generate business model prototypes alone. Always find a partner. It’s also very important to set up a time limit for prototyping your business models. Don’t spend too much time on one single prototype. And follow only one rule in prototyping on Business Model Canvas: never write on the canvas itself. First, if possible try not to prototype your business models alone. You should find a partner. Or two of them. You’ll need somebody who is more analytical, a rational person with some experience in finance, if possible. And the other partner should be somebody who is good at synthesising things, somebody who is good at seeing the big picture and is used to trust her intuition. The latter should be responsible more for the right side of canvas, for the Channels, Customer Segments, Customer Relationships, and very importantly Revenue Streams. Your analytical partner should be more oriented towards Key Resources, Key Activities, Key Partners and not least to the Cost Structure of your business model prototypes. Your main role in prototyping your business models is to define and pivot around your Value Proposition. You should also be the time-keeper of your prototyping party. Second, don’t spend to much time on every single prototype. It is very important that you have at least six, if possible up to nine business model prototypes. It is a very good measure if you spend only 18 minutes or less for one business model prototype. To come into the mood to prototype business models start with a game called Crazy Cow. And last but not least, there is no such thing as a perfect business model. Nobody has it. Therefore do not write on the Business Model Canvas itself. Us post-it notes or even better stattys. When you’re done with prototyping of one business model, document it. Take pictures, share it with your customers and partners, try to find out what on that particular prototype would work and what wouldn’t. Don’t worry if your prototype doesn’t work. It is a good thing if you realised that your business model prototype has failed. Try to fail with at least costs involved as possible. You should develop the circle: —Prototype—Fail—Learn—. The secret lies in how fast are you capable of turning this cycle around. Good luck. This post originally appeared on Zemanta’s blog. I’m exploring & researching the inter-dependence of business model innovation with design thinking. You may wish to hire me as a Business Design Coach or Senior Lecturer in Design Management or as a Key-Note Speaker at your next event. Tags: business model design, Business model generation, business model innovation, business model paterns, Design Thinking, Economy, Innovation, Problems. Bookmark the permalink.